MARION, Ind. 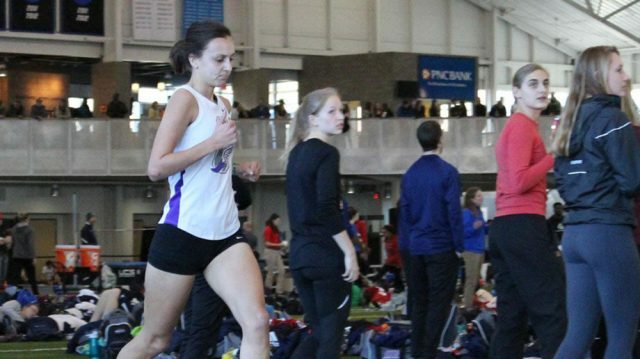 — The Goshen College men’s and women’s 4×200-meter relay teams provided the topic of discussion this past Saturday at Indiana Wesleyan University’s Midwest Classic as the men took the top spot and the women took a place in the record books. The quartet of Jill Steinmetz, a senior, Mara Beck, a junior, Alyssa Arella, a sophomore, and Natalie Omtvedt, a first-year, combined to knock 10 seconds off GC’s previous best event time set in 2015. Clocking in at one minute and 59.84 seconds, the finish was good enough for a third-place overall finish in the event, giving the collective GC women’s track unit their best placement of the season thus far. Beck and Steinmetz also starred in their respective individual performances as Beck took sixth in the 600-meter and Steinmetz took seventh in the 1,000-meter haul. Omtvedt also found success in her personal trek, posting a 12th-place mark in the 200. More individual success was found off the track for the lady Leafs as the Rodriguez duo of Suzette and Kassandra, first-years, finished eighth and ninth respectively in the shot put. S. Rodriguez tallied personal bests in the said event as well as the 20-pound weight throw. Ari Benjamin, a senior, and Ollie Smith, a junior, combined with Uriel Macias and Lukas Kanther, first-years, took the top spot in the 200-meter with a time of 1:36.51, just three seconds shy of the school record. Smith and Kanther also joined forces with Salvador Escamilla, a first-year, and Vincent Kibunja, a sophomore, to tab another first-place finish in the distance medley relay. A variation of the two relay units teamed up once again to take sixth-place in the 4×400. Benjamin, Smith, Kanther and Kibunja crossed the finish line in 3:36.83. Throwers Austin Weaver, a senior, and Jacob Gerber, a first-year, chalked up the team’s top individual placings in the shot put with Weaver taking 11th and Gerber taking 13th. Both Goshen men’s and women’s teams will return to action this coming Friday and Saturday as they return to Indiana Wesleyan to take part in a two-day Crossroads League Championship series. The events are set to commence at 12:30 p.m. on Friday, followed by a 1 p.m. start on Saturday.